If you’ve had the chance to play Google Image Labeler, now you can try out Microsofts take at a game for searchers that will also help their algorithms. 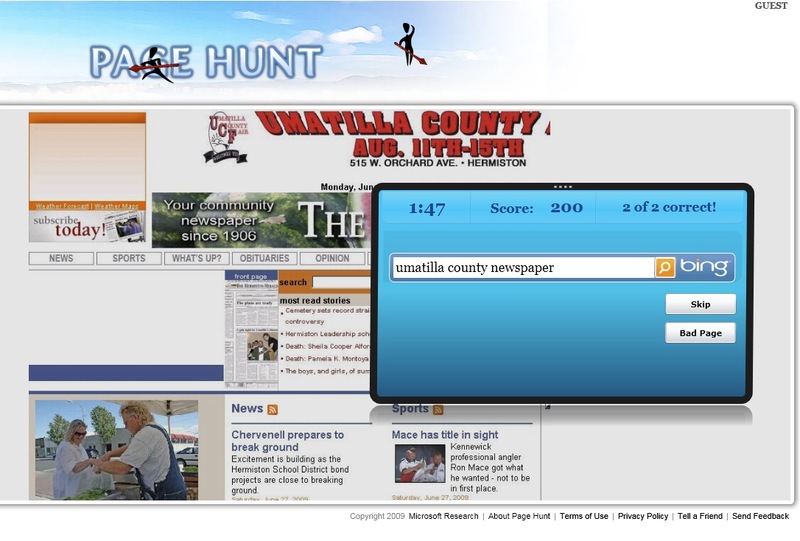 Page Hunt is a new game from Microsoft Research Labs that will serve up a web page and you have to guess the keywords that would cause this page to show up in the search results. You only have two minutes to score as many points as you can. If you guess the right words that make this page show up in the first 5 search engine results, you win. Microsoft wins here too of course, because this kind of information will be used to update and modify their algorithms for Bing. They want to see if the right results are coming up for the keywords the users think should apply to those pages. When you’re done, you can review your results and see how well you did or you can just start a new game. It’s fun for a while too and great way to waste a bit of time.